All the talk of spending cuts in Washington is fictitious. Even the House Republican Study Committee budget allows spending to increase, on average, by 1.7 percent each year for the next decade. The Ryan budget, which critics deride for its “savage” cuts, allows spending to rise by an average of 2.8 percent each year. And Obama’s budget allows spending to climb, on average, by 4.7 percent each year – which is more than twice the projected rate of inflation. Too bad American policymakers can’t copy the Baltic nations of Estonia, Latvia, and Lithuania. Like the United States, these nations got in fiscal trouble, thanks to the combination of excessive spending and an economic downturn triggered by falling real estate prices. So they reduced spending. Not in the Washington sense, where politicians get to increase spending and call it a cut because outlays didn’t rise even faster. 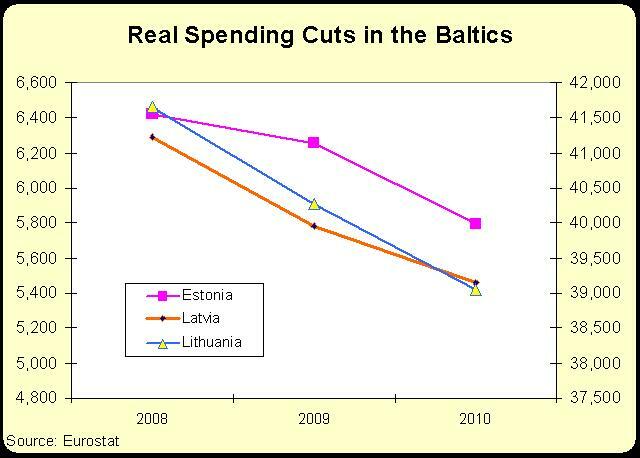 The Baltic nations imposed real cuts. And not just for one year, but in both 2009 and 2010. Here’s the data from the European Union for the Baltic nations. Interestingly, it appears that fiscal restraint has been very successful for the Baltic nations. After suffering a steep downturn, economic growth has returned. Amazingly, Estonia is even back to having a budget surplus. It’s also worth noting that other nations have enjoyed great success with fiscal restraint. This video shows how Canada, Ireland, Slovakia, and New Zealand dramatically reduced the burden of government spending by freezing or capping outlays. Not quite as impressive as what’s happened in the Baltics, but definitely very good compared to what’s been happening in the United States. Your video showed a picture of a Sydney, Australia to represent a New Zealand. on December 11, 2011 at 5:29 am A.S. The Baltics made the cuts not because of some extraordinary prudence but because of having no options (take EC and IMF soft loans and go under direct financial survaillance or default in a major way – probably Estonia was the only exemption). The result is that the government plays even bigger role in the economy, the environment for business is even less competitive, high-level corruption is present with every major infrastructure project, domestic investors are moving their investable funds elsewhere and population is shrinking due to mass emigration. This is anything but success story … GDP drop of 25% during the crisis — even Greece looks better than the Baltics. Thanks! I needed those facts for a paper that I am writing! Excellent post!